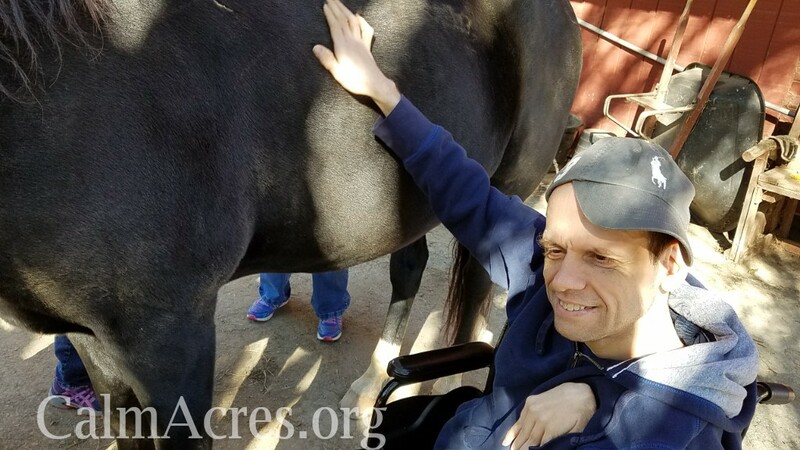 who believe more research is in order, there's a general consensus that therapy animals can be a highly beneficial addition to treatment programs for people with disabilities. Equine facilitated learning seems to have the best results. 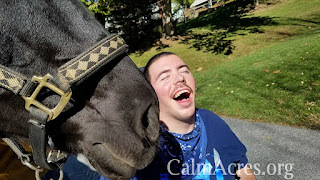 Being in the presence of horses helps a person focus while the calming environment helps them feel calm. Our program is unique in that we believe in letting the horse pick the person, rather than "assigning" the person and horse to each other. It's a unique method that has had excellent results. We allow each person to greet each horse. We watch for the horse's reaction. If the horse dips his head or nuzzles the individual, it's an indication that a bond is being formed and the individual has been "chosen". The tactile senses are stimulated. The horse's hair coat is fuzzy, the mane and tail are rough and the nose and ears are soft. Discovery of these sensations often helps draw an individual out, stimulating development of the individual’s verbal communication and interest in other physical objects. 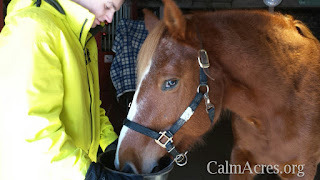 Motor skills are also developed as the person learns to groom and work around the horses. Equine facilitated learning offers a safe, secure environment where a staff member, and community members will be close at hand as new skills are learned. These new skills, and the individual’s continued improvement upon them, increase their self-confidence, which increases their desire and willingness to learn skills at home and/or at school. Learning is no longer scary, but fun, interesting and rewarding. before experienced angry outbursts or who rarely smiled are suddenly calmer, and smile more readily and frequently. Often, they begin making eye contact with the horse first, then with other people in the group. Soon after that, the individual often becomes more socially open; again, with the horse first, then with individuals in the group. It is our wish to improve the over-all well being of each individual who participates in the equine facilitated learning experience.